Incandescent bulbs for use in 6.6 amps constant-current series roadway lights. They're made by Westinghouse, and the barely visible etch on top reads "W" 6.6 A 6000Lm. They are massive in size. These series street lights fascinate me, we've never had such a system over here. I have just found that lamp and will put it up next day as I have done my limits for today, it shorts out when its burnt out Its very old. Yes, very few places still use series incandescent systems. Suburbs of Pasadena, CA is one I can think of, with a combination of post-top acorns and radial waves. They slowly ramp up when they turn on, it's pretty neat. I always wondered if this simply the way the constant current transformer is working when powered up, or if this is intentional to avoid in-rush current. Also, don't ask me where they still get replacement 6.6A bulbs haha, because I've looked all over and can't find any! 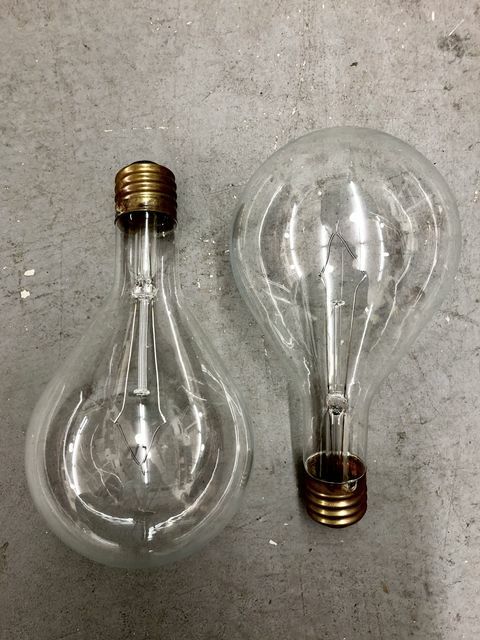 The major lamp manufacturers stopped listing incandescent series lamps at least 20 years ago. That’s not to say someone might still be making them. The New York City Subway System still uses Chinese made 130 volt 36 and 56 watt street railway lamps operating 5 in series on the 600 volt track circuit. I recently purchased a set of contract documents for maintaining traffic signals in New York City. It specified that all replacements of incandescent bulbs shall be 16,000 hour traffic signal bulbs. I had never heard of 16,000 hour traffic signal lamps. H&H Lighting makes them in the USA. They are listed on eBay ( 273478381250) . So anything is possible. Check out eBay item 310372615814. This is a 175 watt GE mercury vapor luminaire for use on 6.6 amp series circuits. Note the 5,000 volt wire on the primary of the ballast and matching high voltage terminal blocks. I've seen that 175W series luminaire before, and yeah, the fat terminals gave it away. The thing I don't understand is, why isn't the voltage listed on the label? I know very little about series systems, but any electrical device I know has to be rated for a voltage supply. Surely you can't just hook this up to whatever voltage you want, as long as it's 6.6 amps. Even series Christmas lights replacements have a voltage rating. I heard NYC subway still uses incandescents as they're though enough to endure grime, vibrations, socks, etc. Regarding the traffic signals, I barely see incandescent tricolors anymore, is there a reason why NYC is sticking to incandescent as opposed to the LED bandwagon? In a lighting store located in West Los Angeles I found several NOS GE 2500 lumen 6.6A street series lamps. Of course, I bought em. @Miles, those series lamps are designed to operate on a current regulated circuit. No matter how many lamps are lit or failed, it always maintains 6.6a. In reality, current, ie, electron flow, is what heats the filament. In this current regulated situation, the actual lamp voltage becomes unimportant as long as the lamps all match each other in amps. However, if you wanted to run just a single lamp unregulated, the fixed voltage supply will then become important. That will determine lamp current. Best thing to do is get an AC ammeter and a variac capable of at least 6.6a and slowly turn up voltage until amp reading is 6.6a then measure what the voltage is. I have found that in some cases, for example, the voltage across the lamp may be like 11.5v. If no variac, maybe try a 6v or 9v low voltage transformer to start with that can handle 6.6a just to see how it lights up and watch the current reading and work your way up. One other thought...if these lamps are say, 18 lumens/watt (avg. incandescent), 6000 lumens would be ~330w. 330w divided by 6.6a is around 50v. But always start lower V than guessed calculation. Hey Don! So are you saying that the constant current transformers that feed these series luminaries adjust its voltage based on the load / pull it receives? Otherwise, this is what I don't understand: In my mind, you still need a voltage rating, even for a series electrical set-up, no? I take the example of Christmas lights, they're not rated in amps, they're rated in volts, as you divide the voltage supplied by the amount of bulbs. How does it differs for bigger incandescents used for roadways? They must have a set number of heads they can install per series loop feed? Yeah, the series streetlight regulator has a magnetic mechanical design that raises/lowers voltage to maintain steady 6.6 amp. The incandescent series Christmas lights are voltage rated because there is no current regulation. The way they are designed, when a single bulb fails, it shorts to keep others lit, and the remaining bulbs get a slightly higher voltage since the source voltage is fixed. That can cascade into faster failure with remaining lamps as they keep getting a higher and higher voltage to take up the slack causing a higher current. With the streetlights, a lamp failure won't change the voltage across the remaining lamps because the current is always maintained. Voltage and current are proportional in a resistance circuit. In that case, series HID luminaires such as mercury vapor must be incredibly inefficient on such circuits. I'm assuming since it's not a filament acting as a load / resistor on the circuit, you'd have to get a ballast that call pull a lot more when the lamp fails, or have some sort of isolation transformer that runs like a resistor? I don't think anything other than incandescents were ever used in such a system. Although as I'm not in the US, I could be wrong, although I don't see how..! @Miles, pretty cool. I think I've seen other series-HID ballasts on eBay before. Even though they are inductive, there are similarities in how they behave on the 6.6a series circuit...but I've never experimented with one. I wonder how the run-up is compared to a regular reactive ballast with fixed mains voltage. On those (if LPF), the starting current is much higher than when fully warmed up. Here, it would be always 6.6a. Probably more efficient in some ways because the entire circuit is always 6.6a so there may be less wire losses in resistance, whereas regular 120/240v circuits can be in the tens of amps or more. I'm only speculating. Incidentally, even though each ballast has a low voltage across the primary (or across incandescent bulb), the open circuit of the regulator can be a couple thousand volts as I understand...just like how a single Christmas light bulb are a few volts, the whole string is 120v source. Just found this...I'll be reading it. 6000 lumen lamp- 6000 hour- 52.6 volts. The ballast in the ebay link luminaire looks beefy. Possibly double the function as a running resistor / shunt in case the mercury lamp burns out? Some good info therethanks to you all, have a look at my very old series lamp showing how it continues to conduct current when it fails???? I did not see any incandescent lamps in use in the subways there when I was in NYC a year ago, but the subway stations and Grand Central Terminal had loads of F72T12 slimlines. The F72T12 is generally a fairly rare size, so this is probably to keep people from nicking lamps for their own use. I generally avoid going there cuz expensive and I hate cities in general. Upstate is bad enough. We had street series here in Australia although they were long gone before I was born, they were made in 6.6 and 20A ratings. I have one in my collection. They were used to replace things like Pockell-Bell and Brush-Veinna carbon arc lamps that were the original series streetlights. Interesting use....I wonder are they just low voltage lamps run in parallel from a low voltage generator of batteries on the boat or are they series lamps run from a higher voltage. Series circuits as such are exotic enough but the existence of MV ballasts for series circuits is another level of awesome. As HID lamps are constant current devices all that would be needed is an ordinary transformer, used as a current transformer with an appropriate turns ratio. A standard 400w mercury lamp runs at 1.98A, so all that would be needed to a 33:10 turns ratio transformer with the "10" turns in the series string and the mercury lamp on the "33" turns of thinner wire side, of course the actual number of turns would depend on the core size...so 400VA, so saturation would not occur but the primary-secondary turns ratio would remain the same. Actually, by tapping the secondary of if such a transformer, a wide variety of modern HID lamps could very easily be run off such a circuit. The Current transformer driving the whole string would have a magnetic leakage path around the secondary exactly like a neon sign transformer, but bigger and with a secondary of a much lower open circuit voltage and would with thicker wire.